What the Pharmaceutical companies don't want you to know about Vaccines by Dr Todd M. Elsner, D.C.
a book by Dr Todd M. Elsner, D.C.
At first glance, the cover of this book might seem graphic. If you count the needles in the infant, you will come up with eighteen. If you count the needles in the background, you will arrive at 63. This is only half the story. Today, according to the CDC’s recommended immunization schedule, a child receives 36 shots containing a total of 126 vaccines from birth through six years of age. This is quadruple the number of vaccines a child received in the 1980’s. In 1983 a child received only 10 shots containing 30 vaccines. Could this quadrupling of the vaccination schedule be responsible for the drastic increase in childhood disorders we are seeing today? Today, one in five children suffers from asthma, one in six children is diagnosed with a learning disability, one in 150 children is diagnosed with autism, one in 250 children has some form of arthritis, and one in every 400 children has diabetes. Are we trading chickenpox, measles, mumps, rubella, and other harmless childhood illnesses for a lifetime of chronic disease? Are vaccines really responsible for the decline in infectious disease? Were polio and smallpox really eradicated through mandatory mass immunization programs? Or is there a chance the vaccines were really the culprit for the spread of these infectious diseases? Can a contaminated polio vaccine be responsible for the current AIDS pandemic we are seeing today? Ever wonder what is in that shot your child gets at the pediatrician’s office? Ever thought about how that vaccine is made? Is the dosage safe for your child? Surely it is safe—the CDC claims it is. And by the way, these vaccines have been studied for their long-term effects regarding any carcinogenic, mutagenic, or reproductive potential, right? You’ll be shocked to learn the answer! Is there a chance those well-baby checkups are really poisoning your child? 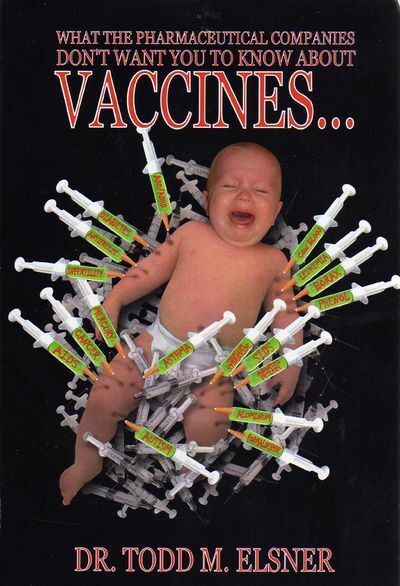 Do vaccines really contain all those chemicals and cause all those diseases that are listed on the cover of this book? Yes, and Yes. The chemicals contained in these vaccines are only the tip of the iceberg, and the diseases listed are only a fraction of the conditions these vaccines can possibly cause. Oh sure, you are probably thinking—there is no way that can be true. Well, according to the vaccine package inserts, these poisons are in the vaccines, and the listed side effects are in fact listed in these inserts as adverse reactions. You will never hear a pediatrician discussing this with the parents who are about to get their child jabbed. Any parent considering having children—or who already does—needs to be properly informed of the risks and the benefits of compulsory vaccination. This book is the other half of the story that you will not hear from the pediatrician or from the CDC. If you want the best for your children and want them to be healthy throughout life, then this book is a must read! I will automatically be labeled by the pro-vaccination community as “anti-vaccine.” But if being labeled as anti-vaccine means that I am against injecting hazardous waste, known carcinogens, neurotoxins, harsh poisons and cancer-causing monkey viruses into children, then I will be the first to take the credit of labeling myself as anti-vaccine. The Centers for Disease Control and Prevention (CDC) is the authority when it comes to vaccines. If one were to research the law in America, they would go to the United States Supreme Court. Well, in the vaccine world the CDC is the U.S. Supreme Court. The buck stops there. The majority of the information in this book comes directly from the CDC. The rest of the information comes directly from the pharmaceutical companies’ vaccine package inserts, the Food and Drug Administration (FDA), the Institute of Medicine (IOM), the United States Congress, and from studies published in prestigious peer reviewed medical journals. How about the flu shot that is heavily advertised every fall? The CDC claims the flu takes 36,000 lives every year—a number pulled out of thin air. The CDC further states vaccines are safe and effective. Let’s address the safety issue first. There have never been any studies done to test vaccines for their carcinogenic, mutagenic, or potential to impair fertility. Could this be because vaccines contain carcinogens? Carcinogens cause cancer, who in their right mind would inject cancer-causing agents into a teeny tiny baby? Carcinogens are not the only thing vaccines contain. They also contain neurotoxins, “harsh poisons,” and even hazardous waste. Yes, you read that correctly, hazardous waste. According to Eli Lilly, the manufacturer of thimerosal, “This material and its container must be disposed of as hazardous waste.” So the medical profession disposes of this hazardous waste into our most innocent and purest form of life—our children! Thimerosal never has been removed from vaccines, only moved from one vaccine to another. These vaccines are effective, right? Nope! If a vaccine does take, the immunity lasts ten years at best. Take for example, the hepatitis B vaccine. This vaccine is given immediately after birth for the prevention of hepatitis B—which is transmitted by I.V. drug use and sexual contact. By the time your child is old enough to become a drug-using prostitute, they will have absolutely no immunity from the vaccine. However, studies have shown the vaccine to cause diabetes. In 1980, children received ten shots containing thirty vaccines. Today, children receive over 124 vaccines from birth through age six. Not only are children used as pincushions, they are sicker than ever before. Could the culprit be vaccines? This book describes each communicable disease that a vaccine is supposed to prevent. Furthermore, all the vaccines licensed by the U.S. FDA are described and the chemicals in each vaccine are listed. The chemicals are then cross-referenced with the National Library of Medicine’s Hazardous Substance Data Bank (HSDB) for their human health effects. If the ingredient is not found in the HSDB then the manufacturer’s material safety data sheet is used to describe the human health effects.